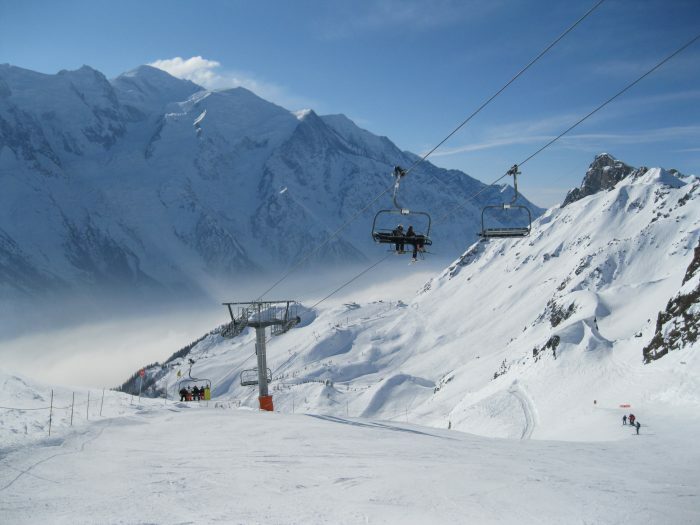 Home | Blog | Uncategorized | Learning to Ski or Snowboard in Chamonix: What you need to know! Learning to Ski or Snowboard in Chamonix: What you need to know! Okay, so Chamonix is probably best known for it’s ‘Steep & Deep’ endless off-piste opportunities aligned more towards the advanced skier but that doesn’t mean it should be totally ruled out for those wishing to learn how to ski or ride in the Mont-Blanc Region. Chamonix itself has a lot to offer its winter season visitors, stretching further than the fantastic terrain. The diverse cosmopolitan atmosphere provides a unique setting with great vibes, interesting people and lots to do. All the ingredients needed for the perfect introduction to the wonderful world of snow sports! We have all been a beginner at some point, although for some of us this is a far reaching memory. That said we all understand what it’s like to be a novice and appreciate the need to match terrain to our ability to make the first few days the most enjoyable (and memorable for the right reasons). I mean after all it’s why us mountain junkies cannot help but come back to the slopes each year without fail. There are a number of well located novice and nursery slopes across the valley and some exciting easy runs for those ready to take the next step, progressing from the beginner ski areas into the bigger ski resorts themselves. These provide the optimal terrain for a quick progression from novice to intermediate learners. Now don’t get us wrong we are not stating that Chamonix is the best ski resort in the Alps for beginners and if you are group comprised entirely of beginners then we would even go as far as saying Chamonix is probably not the wisest choice. However, if you have your sights set on Chamonix, are part of a mixed ability group or you want your children to learn how to ski here then Chamonix boasts some great facilities and slopes if you know where to find them. That’s why Peak Transfer have put together this Beginner’s Guide to learning to ski or snowboard in the Chamonix Valley. In each of the Chamonix resorts you can find a Nursery slope or beginners area. For those staying in central Chamonix the nearest slopes can be found on the south facing Savoy Area or the north facing Les Planards. The Savoy area is without doubt the easier terrain of the two and definitely recommended for very young children with the Les Planards slopes being slightly steeper and equipped with a chair lift. However, there are also beginner areas located in Argentière at the base of the Grands Montets ski area known as Les Chosalets. For those staying at the far end of the valley may enjoy the quiet nursery slopes of La Poya in Vallorcine. However, we would have to say that the two best and most prominent novice areas have to be Le Tourchet in Les Houches and Le Tour’s La Vormaine. Each area is either conveniently or inconveniently, depending on where you are staying located at either end of the Chamonix Valley. Beginners looking at just the local Chamonix ski pass for their first week on the white stuff are best served by La Vormaine of Le Tour. Not only does it boast the friendliest and most extensive terrain compared to the valleys other beginner areas but also sun exposed yet wind sheltered aspects hard to come by in the depth of the Chamonix valley floor. There are three lifts of increasing size with two green pistes and a longer blue to tackle before you pluck up the courage to head up the adjacent big mountains. Beginners staying in Chamonix can take advantage of the free bus service but be aware that this takes around 30 minutes, particularly if looking at lessons. Those that just happen to be located at the other end of the Valley in villages such as Servoz, Les Houches or Les Bossons may consider purchasing a lift pass for the Les Houches Ski area instead. This will allow access to both of les Houches nursery slopes. 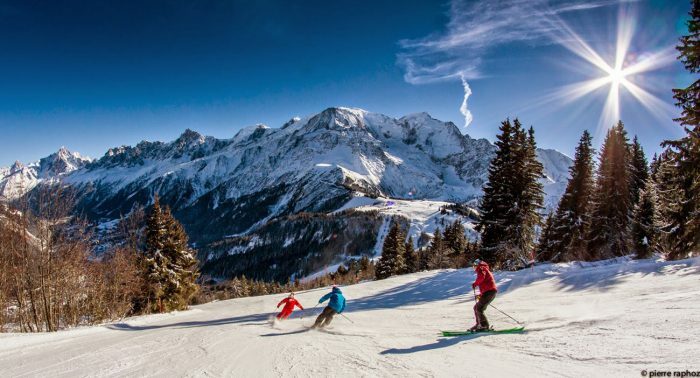 Le Tourchet can be found in Les Houches itself and the more extensive Mont Blanc Area at the top of the main ski area perfect for budding skiers and snowboarders alike. It’s worth noting that almost all of the nursery slopes are located on the valley floor and although this itself is above 1,000m can be less snow sure at either end of the ski season if conditions are not at their best. So you have mastered the beginner nursery slopes and you are ready to play with the big boys and girls in the high mountains. Then you will need to know where to head to avoid a major blow to the confidence or even worse a serious accident resulting in an unscheduled visit to the local hospital. Here are our recommendations for what slopes to hit once in the main Chamonix Ski areas as a first port of call. Probably the most highly recommended ski area to brave when learning in the Chamonix Valley would be the plesent network of lengthy and winding blues in the linked Le Tour and Vallorcine areas. Blue slopes of interest would have to be the Foret Verte a delightful descent through the trees or alternatively the L’Arve, Liaison Balme and Les Marmottes are great for gaining confidence to the slopes. Don’t even think about it!!!!! Okay we will explain ourselves. Think cold, icy and steep. Not the conditions we think are particularly enticing for a beginner skier. Until you are more than comfortable on a challenging blue or cruising red piste there is really not any point putting yourself through the heartache and pain of the Grands Montets Ski area. Even the one or two blue runs here are closer to the red grade in most other ski areas. The Marmottons blue is probably as the easiest piste in the area, but it still can be quite tricky and very busy with advanced skiers travelling at speed gunning to get to the lifts. For the keen beans just wanting to get up the mountain there is in fact a handful of green pistes in the Brevent-Flegere area, a rarity in Chamonix. The highest altitude green piste in the valley aptly named ‘2000’ on the Brevent side can be accessed via the Altitude chairlift after taking the Planpraz gondola from Chamonix. Flegere also has a few longer green runs namely Trappe and Libellules which are easily accessible from the Flegere and La Trappe lifts. For those looking to step up their game can head to the blues of Chavanne, both Brevent and Flegere Liaison runs as well as the Retour Flegere, Vioz and Blanchots pistes. These are all great terrain for those who are able to link turns but would like more of a challenge on longer and slightly steeper slopes. The added advantage of these is the sunny south facing aspect and the unrivalled picture perfect panoramic views of the Mont Blanc Massif and surrounding spires. Again for those staying in Les Houches who perhaps would prefer to stick with the specific Les Houches pass rather than the Chamonix one are spoilt for choice when it comes to rolling hills and open sunny slopes. Les Houches is an excellent place to learn how to ski or snowboard to improve technique. It’s fair to say most of the blue runs in Les Houches are true to grade and if you have mastered the Mont Blanc beginners area and are already linking turns then should not pose too much of a problem. Lessons in Chamonix are provided by Ecole du Ski Francais, Evolution 2 and the British Alpine Ski School (BASS) throughout the valley. Everything from individual private lessons, group classes and children’s kindergarden’s are available. More information can be found on the above websites. We think that’s more than enough for you to sink your teeth into and get started with in the Chamonix Valley. For more information regarding the Chamonix skis areas and the lift passes available then check out our detailed Chamonix Ski Area information here. Or for a detailed guide to Chamonix this winter then click here. Like we mentioned at the beginning Chamonix is definitely not the best resort for beginners but it does have that undefinable wow factor. We don’t know if it’s the majestic backdrop of Mont Blanc, great alternative sports, spa and leisure facilities or the fantastic food and entertainment on offer. However, if for you, learning to ski or board is only a slice of the adventure to be had in the mountains this winter then without doubt you can’t go far wrong in Chamonix. Booked your Chamonix trip? How are you getting to resort this season? Why not take advantage of our reliable, low-cost, private transfer service. Peak Transfer run private door-to-door transfers throughout the year from €185 for up to 8 passengers in our modern well equipped passenger vehicles. Our professional drivers will take you directly to your accommodation door so you can just sit back, relax and get your holiday started the right way. Peak Transfer provide a safe, reliable and professional service with no hidden costs. We do not apply additional charges for luggage, skis or snowboards or for use of our fully safety rated booster, child or baby seats. Book now or receive an immediate quote by completing the Quick Quote form here.